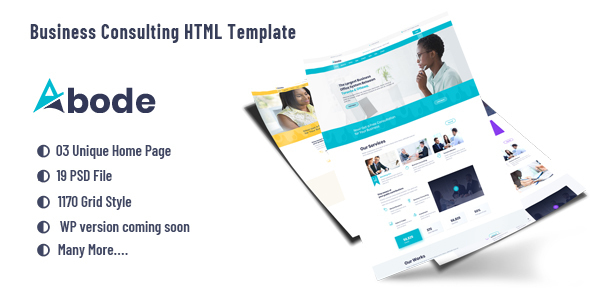 ABODE – Consulting, Finance, Business Bootstrap 4 Template – A stunning one page HTML.... is modern and exclusive HTML template suitable for agencies and freelancers. ABODE – Consulting, accountant, advisor, audit, beaver builder, broker, business, clean, company, consulting, corporate, finance, financial, insurance, trader Bootstrap 4 Template was designed in best possible look with flat, clean and clear design that will make your website difference from others. In line with Modern Design Trends, Color Fresh Creative + Detail Layouts with elegant look! This one will be an amazing choice! If you like my template, please please please rate it 5 stars. Thanks! 19 HTML files included – The design is very easy to work with and modify to suit anything you need. Fully Clear and Clean Design.